Summary: Bestselling author Mary Alice Monroe returns to her beloved Isle of Palms to tell the poignant, charming story of two women, one summer, and one very special beach house. I'm still catching up on writing reviews for the books I read while we vacationed in the Outer Banks last month. 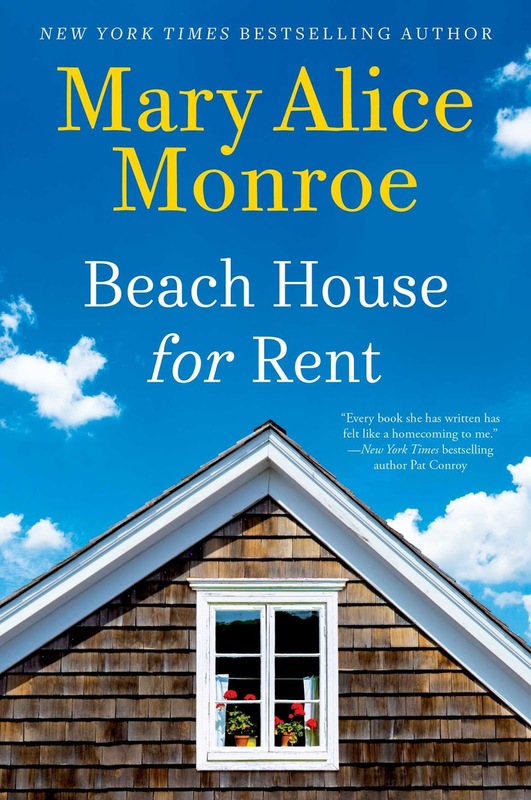 One that I loved (and was truly a perfect beach read) was BEACH HOUSE FOR RENT by Mary Alice Monroe. I have only read one of Ms. Monroe's novels prior to this one, and I have to say that I should be reading everything she's written. I truly enjoy her characters and her stories. BEACH HOUSE FOR RENT tells the story of Cara Rutledge, a middle-aged woman who lives on the Isle of Palms. She and her husband need a little money to support his ecotourism boat business, so they decide rent out Cara's family home to Heather, a woman who has been selected to paint bird photos for USPS stamps. Heather has always had anxiety issues; however, they got much worse after an accident a few years ago that took the life of her mother. She basically intends to stay to herself, take care of her canaries, and of course, paint some of the gorgeous shorebirds that visit Isle of Palms. Things don't exactly work out as both women had planned. Cara experiences a major tragedy that sets her life on a totally different course, while Heather finds that she's attracted to the guy who works on her beach house and rescues birds. Cara just wants to break the lease and return to the comfort of her mother's home, but Heather, enjoying her budding romance, isn't quite ready to leave. With so much change in both women's lives, Cara and Heather end up discovering a bond of friendship that helps them both find inner strength... and the ability to move forward in challenging times. I just adored BEACH HOUSE FOR RENT! It's a touching story about two very likable women... and it takes place at the beach. What more can you ask from a summer book? I really appreciated how Ms. Monroe created two very memorable characters, each with their own set of flaws; and the messages in her story were extremely heartwarming. In addition, I'd be remiss if I didn't mention how much I liked how the author incorporated her love for nature and animals into the novel. There was a very interesting element of the book that dealt with one of the characters volunteering for an organization that helped save shorebirds. Ms. Monroe does a ton of conservation work herself, and it's obvious in this novel that it's one of her passions. One thing that stood out to me in the novel is that there were some very difficult issues addressed. Cara's character is still reeling from the loss of her mother when another sudden tragedy occurs. The way grief was portrayed through Cara's character was so gut-wrenching... and so real. I was extremely impressed with Ms. Monroe's writing when it came to sharing Cara's grief with the reader. At times, I could almost feel her pain! And then, Heather had her own set of issues that were equally well presented. Heather also suffered from grief after losing her mother years ago. I love that the characters shared these feelings and that was one of the reasons they understood each other so well. However, Heather's major problem was that she suffered from severe anxiety -- I'm talking severe! It was so enjoyable to see how her newfound love made her feel comfortable enough to take some chances again. Of course, I'm a sucker for stories about female friendship; and at its heart, BEACH HOUSE FOR RENT was just that. Even though a few decades separated these two women, they were still able to become friends. And together, they were better for it. They were able to overcome some of the obstacles in their lives and learn to live again! I think BEACH HOUSE FOR RENT would make a fabulous book club pick. The setting alone makes it a wonderful summer read, but the characters will give you plenty to discuss. There is a reader's guide available with fifteen questions along with some ways to enhance your book club experience. Some of the topics you might want to talk about include grief, love, guilt, the healing quality of pets, mother/daughter relationships, anxiety, and, of course, friendship. Overall, I think if you're on the lookout for a terrific beach/pool book, then BEACH HOUSE FOR RENT should be in your bag. Highly recommended! I just love the way she weaves issues (both personal and environmental) into her stories. I thought this book was great too.